Hi guys! Let's talk about playing Fall of Magic. As it stands, I'll share a link with you guys (privately) to the game's documents. The rules are extremely light, and should be relatively straightforward — but you can ask me any questions. I've played it a few times now, so I'm not unfamiliar with how it runs. Your first homework assignment is to skim that initial explanatory document, and then make characters (the process for which is on the main Beta document). 3. look at the hometown you've selected, by picking a title. The Names and Titles are both entirely open to interpretation as to what they mean. Vago the Golem could be a scraggly little misanthrope who only loves jewelry, or an enormous ten tonne display of magic and stone that towers over anyone it encounters. Your call. Said ten tonne monstrosity can also be a man, if you choose. We're open minded here. So think out loud, and don't be ashamed to claim dibs on something if it jumps out at you! So I wanted to give everyone the opportunity to look at the character options, and possibly get their vote in for things they might like to see... But in the interest of getting the conversation started, I think I'll post my current musings. I'm currently playing in a game where I'm an Heir of Stormguard, so I think I'll pass on a Stormguard character this time around. 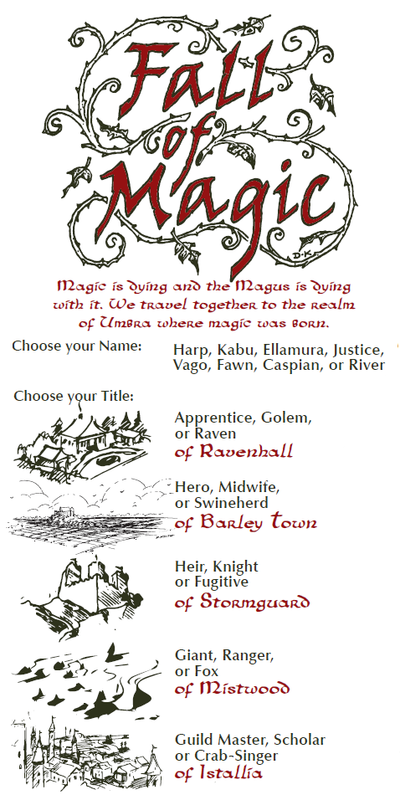 I'm intrigued by the idea of a Raven (of Ravenhall) or Ranger (of Mistwood)... I like the idea of a Raven being a magical apprentice who has graduated on to a journeyman rank Mage, rather than an actual Raven. Maybe someone who has a stake invested in magic itself, and feels like they came to the game too late, and is desperately trying to justify their life. The other option would be a Ranger who has been hired to help guide the party through the less traveled parts of the journey. Someone knowledgeable, but disconnected from the magical world. Hmm. Been thinking a lot about Fox of Mistwood - as an actual fox, yes, but also as a trickster spirit and shapeshifter, as in [most] folklores. Maybe a peasant hero like Reynard the Fox, or something more supernatural as in Japanese. The dying-out of magic is obviously of concern to a magical being like this. Maybe the Fox gets weaker as time (or distance) goes on. What else - a Guild Master of Istallia could be cool. I'm thinking about interesting trades that the Magus might have called upon. Or maybe a Knight, Giant or Golem as a bodyguard type. I'm also intrigued by crab-singer, because wtf is a crab-singer? No strong feelings either way this far. I'll see what everyone's thinking. I think the Fox is a particularly good idea, and you could do really well with it. Of course, so could the Guild Master, who is well connected, and capable. Even if he/she doesn't have a specific trade, having somebody who is successful, with resources and stature could open a lot of doors in the fiction. I think I want to do Harp, Fugitive of Stormguard. I'm a carminomancer. I use songs and poems to weave magic through rhythm and sound. (Some call us bards, but they're not learned.) Not a common school of magic, but an effective one...and I may have used it for, y'know. Nefarious purposes. Running cons. Stealing stuff. Persuading entire towns to donate their silver into my lute case. So. Yes. Fugitive from Stormguard. The Storm Queen and her knights heard about what I did, and she's put out word that I'm to be brought in. I'd rather not go. I kind of like the idea of playing some kind of character that's a bit out of place. Perhaps a creature of some kind who looks human enough to pass, and is therefore cut off from their people. Perhaps Caspian the Raven of Ravenhall? That works for me, Todd! If that's what you're thinking, I think I'll go with my Ranger idea. Ellamura the Ranger, who is generally aware of magic, but its disappearance from the world would not affect her day to day life very much — or at least, so she thinks. I see her as a devil's advocate to all these magic types running around. Okay, finally. For a multitude of small annoying reasons it took me a few sittings to write this post out. *deep breath* Here we go. Kabu the Fox is hundreds of years old. Kabu has lived many lives as a human- a fisherman, a governor's wife, a bandit- but he is (or was) a regular fox, not (as some say) a forest god, demon or trickster spirit. All things have their innate magic, some more than others. Foxes in particular are masters of disguise and deception, and exceptionally ancient ones become masters at shapeshifting. There are many foxes in the Mistwood, but Kabu is THE fox of the Mistwood, if you get my meaning. Hot sauce! With all the characters now created the next step is to start a scene in Ravenhall. I'll start a thread exclusively for the location. Since we need to take turns setting up scenes as part of the game mechanics, I'll just post a quick summary here. We all start with our player markers off the board. When no player markers are on the board, the first player places the Magus on Ravenhall, and frames a scene from the Magus' point of view. This could be a scene with dialog, or just something to set the mood. Feel free to call out other people to play certain roles if you like. When that scene is complete, the next player in turn order sets a scene (I'll post the location and all the scene prompts at the beginning of the thread for ease of access). The scene prompt (must be narrated into the scene). The scene prompt must be included in the fiction before the scene ends. Other than that, a few scenes require die rolls to determine the scene prompt. Some scene prompts add a tag to a character (the "+" symbol), and some mean they trade off a tag or a title (the "*" symbol). It's all detailed in the introduction document I forwarded everyone, and I can always clarify when we cross each bridge, too. Unless someone has a desire to play the Magus first, I'd be happy to get us up and running. Does anyone object to the following turn order? Hey guys, if you're still interested (and able), let's get Todd to kickstart the first scene by choosing a scene prompt.